It’s been over a month since Scott left for Bahrain and June has been like most other Junes. And it’s been like nothing else I have ever experienced. The end of May seems ages ago, and yet, here we are, already sliding into July. We have navigated a trifecta of holidays without Scott: Memorial Day, Father’s Day, and our ninth wedding anniversary. Gus graduated from preschool, the boys began another round of swim lessons, and Oliver fell at a birthday party and needed his face glued back together. We got a puppy (more on that later) and I fixed the internet after a storm blew it out. I take out the trash now and lug those huge water bottles onto the cooler and send in the bills. I have stacks of unread books and blogs but I drove to Pennsylvania and back, where I saw a Mennonite man in Walmart. He reminded me so much of myself in the way he looked out of place, the mud on his boots coming from another time altogether. Scott’s leaving left a gap in my own life, a rabbit hole, where I have been tunneling between my old life and this new and different world. I have solitude to contend with now and a heightened sense of responsibility which lays across my shoulders like a fur robe. Sometimes, it is heavy and grave, and other times, it’s a rich privilege to be reminded of my own capabilities. I was single for many years, but since I have gotten married, I have abnegated so many responsibilities, maybe even responsibility for my own life. It’s so easy to call into the other room that the internet is down, that the sink is being weird, that I don’t know how to print out my insurance card, that I shouldn’t bother trying to do anything with my life because I’m just going to move again in two years. It’s so easy to be powerless and to blame – to say if only – to imagine that someone or something is keeping you from something. And it’s now both embarrassing and liberating to realize that that someone was me. Over the past few years, I have taken the wife role so seriously: The laundry and the cooking and the work events that felt so mandatory. Now that it’s only me, I see how so much of that nonsense is optional and that I really do have a say, even if it’s only to say screw it. The week after Scott left, all three of us were exhausted and staggered through our days with a varying degree of tears (sometimes mine). We have been able to FaceTime with Scott almost daily, if only for a few minutes, and this seems to satisfy Gus, who holds the phone over his Lego creations and his Lego man and says, “This part is where he keeps his gems, this red piece is the control panel, and this piece here is left over from Oliver’s Thunder Driller,” until Oliver begins to yell that now it’s his turn and Gus has had enough time. Saturdays are the hardest. Scott used to take the boys for most of the day while I drove 90 minutes to a yoga studio or simply did errands. Now Saturdays are glum and Oliver is usually in a foul mood. This Saturday I had the terrible idea of trying to replicate the “Daddy Days.” I made cinnamon rolls and took the boys rock climbing, and by noon, all of us were yelling. My friend Alana coined the term “coming out sideways,” and this is how Oliver’s – and my own – feelings are being expressed. 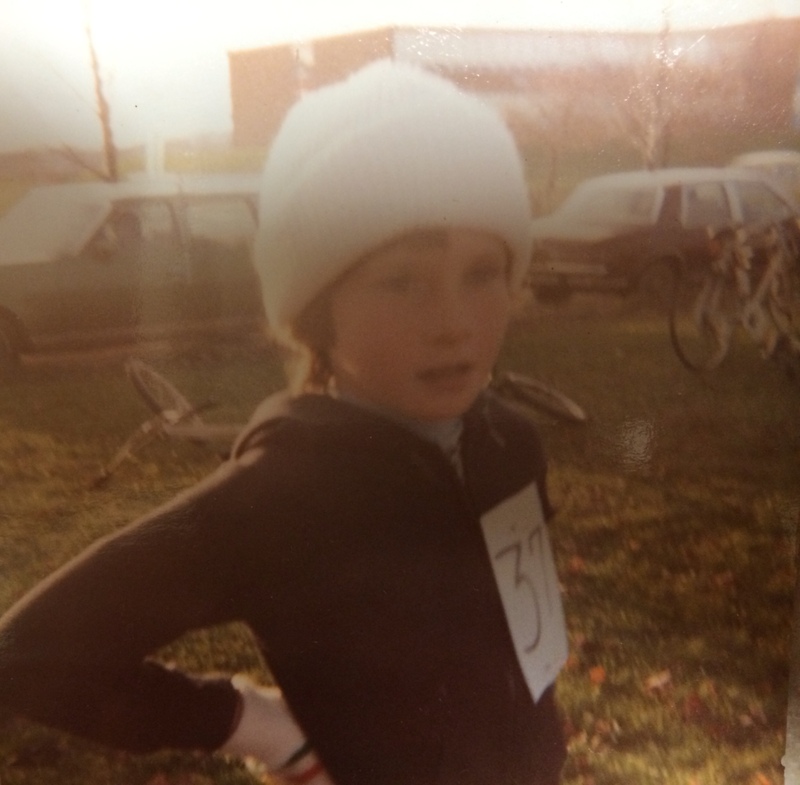 I have been heartened lately by thoughts of distance running, which I can’t do anymore but which I did for many years starting with my first cross country race when I was eight. In college, cross country races were about three miles, and the first mile was always the most difficult for me. While I could run one pace for a long time, I had no natural speed. To even get a half-decent position by the middle of the race, I had to take off from the start as if lions were chasing me, dodging the melee of elbows and hair ribbons, pony tails and spikes. By the time I made it to mile two, my breath was thin and ragged, my stride uneven, and I felt about as shredded as I do now. Joanie Benoit once said that the key to racing is to find your pace, and then find your place in the pack and get comfortable there. I have been thinking about this advice a lot, thinking that maybe it’s OK that I end most of my days feeling weak and shredded, because this is what mile one looks like. I remember the way my breath came back in mile two – two footfalls per inhale – and hope that tomorrow I will hit my stride and the footing will be better. I am trying to be patient, both with myself and with my boys. I am trying to do less and slow down more, which is difficult for someone who is used to running, if not fast, then constantly. When I look back on June, I’ll remember that we got through, but just barely. And yet, what an interesting time this is, like one of those bizarre social experiments from the seventies: What happens to a traditional stay at home wife when you take away the husband? As of now, I have no idea, but it feels like something of a privilege, if a hard-earned one. Lindsey and Aidan have been writing about marriage this June, and I think it’s kind of a wonder to have a 12-month separation that isn’t due to unhappiness. I have a marriage sabbatical, or maybe a marriage retreat, and I am intrigued by this idea of hunkering down and peeling off the traditional garb I was never very good at anyway. I am clueless as to what the next eleven (gasp!) months will bring, but it’s still early in the race. We’re still finding our pace. I read this and thought, YES. To all of it. Beautiful writing. Thank you my fellow military spouse! Hopefully we will meet up again. Thank you Lindsey. And thank you for your words which are always so inspiring. Love the analogy here, and am amazed by your ability to learn and grow from this experience rather than wilt under the pressures and the new-ness of it all. Thank you Dana. I have many wilting days. Wow, this is so powerful and fascinating. What happens to a traditional wife without a husband indeed… My husband is not away but we’ll be moving this summer and for the first time e will have a commute and be away longer hours. I realize this is in pale comparison to tuyere year long (!) separation, but there is much I can relate to, especially how many things I let my husband take care of and how clueless I am regarding certain things, and how I’ve let my own dreams fade a bit. I really enjoy your writing and wisdom. Thank you for sharing this journey. Dana, your transition does not pale at all in comparison. A move and then a longer commute and more hours away! Wishing you much ease and comfort in your transition because I know it’s a big one. I think as moms, we all have to let our dreams fade at times, and it’s my hope that we can all remember to pick them back up when we have time again. Beautiful! You always know how to find your pace, Pam, and move to the front. It is who you are. I’m cheering for you all the way and sending you love. Thanks for sharing the photo too! Carol! You made me cry again. Thank you!! I can feel you settling in for the long haul even as I read these words, Pam. Finding your own way through, your own pace, your own sense of how to carry on with a peaceful heart. My advice? Keep remembering your OWN wisest advice to yourself, delivered right there in that perfect line: “I see how so much of that nonsense is optional and that I really do have a say, even if it’s only to say screw it.” I love that. As always, a beautiful piece. You have such a way of pulling in all these disparate ideas and making them whole and cohesive. I love the running analogy here (I often say I am a sprinter, not a marathoner, by nature). My husband and I have lived apart for two separate years in the 17 years we’ve been together, but not since we’ve been married, and definitely not since we’ve had Abra. The closest I can relate to is the three weeks he often travels for work in the fall, and I am SO spent at the end of it. I really relate to having to step into all those roles you don’t realize you’ve off-loaded until you have to take them on again, and how LONG the weekends can feel. Also, I love this line in particular: “Now that it’s only me, I see how so much of that nonsense is optional.” For entirely different reasons I’m in the process of shedding some role and responsibilities that I never wanted to take on in the first place, but that I’ve never really questioned, to make room for other things in my life. And boy is that liberating. I think of you often, Pamela. Elizabeth, I am glad you are also shedding skins. It IS liberating! And I think the 2-3 week trips are as hard as anything. Yes:) Slow and steady. Thank you for reading, as always. I often worry that a happy marriage and incredible partnership has weakened the muscles I developed when single and head of household. For me, the adjustment was in reverse — learning to live with someone close by — and now that I’ve made it I get anxious when I find myself relying so completely on someone else for the day to day things and the bigger things as well. As a single parent, I found a degree of peace as well as burden from being the sole decision maker. I think your analogy is dead on. I think you are already sensing that rhythm that awaits you when you find your pace. And you are so right about the things that are optional! Screw ’em. Your words resonate with me. I’ve spent years apart from my spouse with the once in 2-3 months visit. You write about it beautifully, and it does get better…the initial despair wears off as you find your new balance. Thank you Anne, for your encouragement. I can’t imagine being apart for years! However, I am recognizing some of the gifts of solitude. Thank you for writing! Having endured one, six-month deployment to Afghanistan, and another separation, of much less magnitude in our nine year marriage, I am brought to tears by this. I wish I could tell you that it gets easier, or that I knew anything about looking down the barrel of 11 more months. I will say that I am still proud of a few of the moments I spent alone with two children under 3, of the afternoons we managed to scrape together some smiles and even, joy. Those six months were the most difficult and complicated of my life, but they brought us together as a family in a way I never imagined. Best of luck to you; you are already inspiring. Holly, thank you so much for these words! It’s so comforting to know how many other spouses go through this and I am humbled by how often my Marine neighbors have deployed. I am in awe that you did it with children under 3. My mantra for those early years was “Please don’t deploy until the kids are older.” So I got my wish as mine are 8 and 5:) And it IS easier at these ages!! I so know what you mean about the difficult and complicated and also about the bringing you together as a family. It’s so great to know that so many great women – and men – are together in this very interesting and complex experience. Love your writing but can you please change “fowl” to foul? I don’t think Oliver was feeling like a bird! Good catch! I found a few additional typos as well. Thank you. As always, you inspire me. I’ve been hitting a series of “mile one” hurdles, and I needed this reminder to keeping breathing, find my pace, and let the road be ragged, for now. Thank you. “One” says it all, for in One there is no separation—and I do hate separation and never plan to start liking it. Perhaps “pace” is not for the race so much as for the process, as when I start to find myself just “getting through” things I know I’m in the past and the future, and I never find my happiness there. Maybe the pain of uncertainty, of stitches and tears and all the rest of the things that feel like bad dreams and sometimes outright nightmares are teachers of a patient and cunning sort—patiently waiting in that Oneness that is always there, while our consciousness softens its way to dropping the veils we put on unwittingly, “peeling off the traditional garb,” that temporarily separates us from the warm sun of love like clouds that really only change our temporary experience. Or something like that. Mostly just sending wishes for safety and as much happiness as possible all around. As always, Pamela, so poignant and gorgeously said. I can’t even imagine how that would feel. My husband has been out of town for business this week. It was our first time being away from each other since we moved here. Monday morning when I saw him off at the front door, I was a wreck and I’ve been thrown off since. To make matters worse, at 7am this morning, a time when I would normally get up but I was sleeping in after staying up late, I heard a loud knock at the door. There was an older man at the door who I didn’t know. My heart pounded wildly, but I had to put my big girl pants on. I said in my firmest voice that I didn’t know who he was through the door. He apologized profusely and picked up his suitcase and walked away. It looked like he was visiting someone else in the building and simply had the wrong apartment, but boy was I freaked out! Hang in there, hon. You’ll find your pace. Thank you Britt! I think one week can be as bad as a month. And I would have freaked out at someone strange at the door. I am glad it worked out ok!!! I am excited to read your new book!!! Thank goodness Lindsey included this in her Things I Love Lately post because I had missed it and it is gorgeous. Your writing is truly incredible. Thank you as always for sharing it with us. You are living a life that is so different from mine and it is wonderful to walk in your shoes- even the difficult parts- for the moments that I spent reading. “I have abnegated so many responsibilities, maybe even responsibility for my own life” I can so relate to this. Blame. Taking responsibility for the life I live and don’t live and want to palm off on someone else. That man who lives with me and fixes the things that come up. Sometimes it’s because I am afraid of living my own life. So I just settle for small things and then blame the easiest person that I’m living a small life. He is close to me – both kinds of close: proximity and intimate. Fear keeps me from reaching out. This ONE title is such a great reflection on this stage of life when we realize that only I can live my life. I want you to know, however, that I think of you, even when you don’t know I’m thinking of you. You’ve made a difference in my life. Your perspective. Your way with words. They have kept me returning to your “home” for comfort. Coming to you today through Lindsey and I love your honest, open rhythm of writing. I admire you in more ways than I can count. And i know these feelings, though on a smaller scale. I’ve realized just how much I hand over to my husband to do. And I’ve had to find my pace and my place. I’ve just met you but somehow I know you will find yours and soon slip into it beautifully. I am very late to reading this (life being crazed for 20 years and no less do at theoretical empty nest)…. You raise so many issues and so poignantly; how easily (and oddly) we give away independence in the name of love, marriage, fatigue… Even for those not in traditional marriages, when you take away the husband, the struggle for redefinition and reorientation can be arduous. Wishing you forbearance, kindness (for yourself), discovery. My life is nothing like I planned and little like I expected. Then again, it is not uninteresting. blog, however suppose you added a title that grabbed folk’s attention? should look at Yahoo’s front page and see how they create article headlines to grab people interested. You are currently reading One at Walking on My Hands.